Police said Monday 4 February 2019 three operations that resulted in the arrest of 17 people and isolation of a minor for alleged crimes of drug trafficking and the seizure of 873 kilograms of cocaine and 3 000 chloride of calcium ( precursor ). Of the detainees, one was a foreigner and four of them had criminal records for different crimes , police said at a press conference. Agents two also seized vehicles , three mobile phones, two arms of fire, a boat and four boats fast, which were retained as evidence in the various operations that were carried out between the last week of January and last Saturday 2 January. The first operation took place on January 26 in international waters , where the police arrested thirteen Ecuadorian citizenswho wanted to transport 636 kilograms of cocaine to the United States and Mexico . The agents located in the Pacific Ocean – 490 nautical miles off the Colombian coast – a fishing vessel with Ecuadorian flag and named “Marylin Isabel”, which dragged four boats , one of which was found ” encaletada (hidden) in its structure in a triple bottom “the narcotic substance. For its part, last Saturday, the Anti-Narcotics Investigations Unit carried out the operation Tifanny , in the province of Guayas(Southwest), in which he seized 237,286 kilograms of cocaine that also had as destination the foreign market . The agents identified a building in a Guayas urbanization as a center for the temporary collection of illicit substances , so they proceeded to level it and discovered a van that hid in a compartment under the floor 238 brick- like packages with the substance. In this operation an Ecuadorian citizen was arrested who was in charge of receiving illicit substances and coordinating the movement of the alkaloid to the place where he was transferred on board speedboats to an area near the port , where the containers were contaminated . 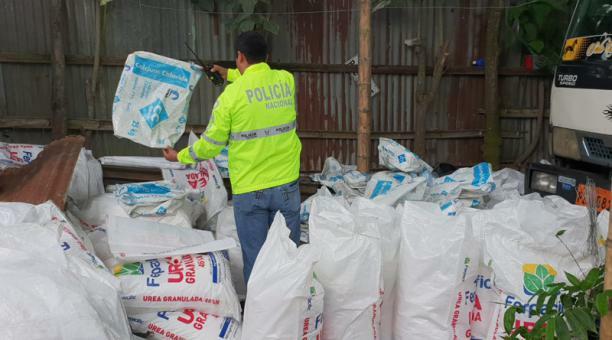 Finally, and also on Saturday, the Chemical Unit carried out the operation “Resurgence” in the province of Santo Domingo of Tsáchilas (west of Quito), in which three were seized tons of chloride of calcium, they arrested two Ecuadorian citizens and they isolated a minor. Research reflected the detainees were part of a criminal organization dedicated to gathering and transportation of precursor chemicals and control subject to the northern border , to be used in laboratories processing of cocaine in Colombia. With these operations the police have prevented more than 8.7 million of doses of cocaine to reach international markets for consumption , they have clarified the authorities.